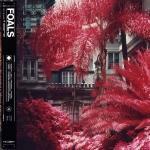 Foals bring with them an interesting discussion: can a band ever really be considered as great if they lack a great album? In the UK, the Oxford fourpiece (since the departure of bassist Walter Gervers in 2018) are one of the last survivors of the late-00s thanks to an incredible consistency and a couple of truly era-defining singles—but no album feels truly essential. The first three feel like they lack that final punch, while 2015’s What Went Down went so punch-heavy that it left no room for the style or intricacies of their other work. It often sounded like they were trying to become another rock band. After an almost five-year break, how does a band respond when their peers have disappeared and younger bands are creeping up on your patch? As it turns out, by producing their best album yet. It makes sense that Foals finally reach the level they’ve always promised—releasing a two-part indie-rock album about the perils of technology that is well-equipped to soundtrack the end of the world. Their music has always jumped between sharp, angular melodies and hazy sprawls, veering from frantic to completely futile. Take On The Luna, which sees a return to the jilted, zippy hooks of Antidotes but with a much richer sound. The song, originally titled End of Days, offers no solutions but reflects the anxiety of someone watching the world fall apart. “Won’t you come emancipator?” Yannis asks. It seems unlikely. White Onions slides in as a reminder that Foals probably could release a 10-song album of straight-up indie rock bangers along the lines of Red Socks Pugie and Two Steps, Twice if they want to, while In Degrees is a song that revels in taking ridiculous turns. Sporting a funk bassline that leads to a chaotic conclusion—reminiscent of Remain in Light-era Talking Heads, it doesn’t sound like anything else in Foals’ catalog, but it might just better most of it. There are also unexpected moments of experimentation. Cafe D’Athens sounds vaguely In Rainbows-esque, while Syrups is a subdued, meandering track that lacks some urgency. They both fall slightly flat compared to the bulk of the singles, even if it proves that the band isn't willing to rest on their laurels.